Hi everyone! Who enjoyed last episode of Last Tango in Halifax? Just joshing, I know we ALL did!! Woo hoo, what a lovely introduction back to life in Halifax where Celia is fussy, the mice are pooping and I really don't see any damp. Let's go look at my new AGA!! 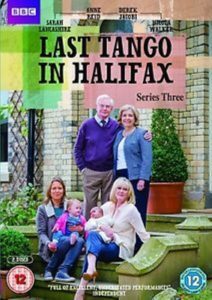 Be aware: this is for the SECOND episode of the Last Tango In Halifax Christmas Special, airing Dec. 24, 2017 in the US on PBS. Read no further if you don't want to be spoiled! YOU GUYS!!!!! You guys Last Tango in Halifax is back and so are we!!!!! I've only been waiting four months (ONLY - felt like 4 years), I can't imagine how excited you lot were! Let's roll right into it, we've a lot to cover on this LTiH Christmas Special! So. This is it, the very last known episode of Last Tango in Halifax until Christmas. I've been dragging my bum a bit on this, not wanting it to end, but time's up! I've distracted myself with River, Tipping the Velvet and Doctor Foster, but it's time to roll S3:E6. I've heard it's a blast! I could not believe last episode of Last Tango in Halifax, you guys. So much wonderful, so much incredibly not-possible. Let's roll after the break.